Oregano is a memeber of the mint family (Labiatae). It is important to realize that wild oregano is not the same as the one found in the spice section of grocery store or the type found in pizze. There are over 30 species of oregano and there are many confusion in respect to its medicinal uses. Medicinal grade oregano arises from an unique species of plants which grow wild throughout the world. The highest grade is found in Mediterranean. A special distillation process is used to extra the essential oil from oregano to preserved its curative powers. Medicinal grade oregano oil is very expensive and difficult to produce. It takes 1000 pounds of wild oregano to produce 1 pound of oil. It's important to distinguish medicianl grade oregano from the oregano used in food, such as that found in pizza and spaghetti sauce. Many times, the ones found in your grocery store is not even true oregano. It is mostly marjoram and its flavor is more pleasant and much milder compared to the true oregano. What's more, many spice labeled as oregano is not even marjoram. Most so-called oregano available on the West Cost is actually a oregano-like plant that merely tastes similar to oregano. It's actually Mexican sage. Oregano has been used for its medicinal values for thousands of years. The name oregano is derived from a Grecian word meaning "joy of the mountains". Ancient Grecian physicians prescripted oregano for conditions such as trauma, wounds, headaches, lung disorders, asthma, seizures, venomous bits, even narotic poisoning. During the middle ages, Islamics used oregano and oregano oil as a germ killer. They also used oregano as a food preserver to prevent microbial growth. Oregano was also regarded as the ideal remedy for head cold in 17th century Britain. Oregano has also been consumed as food throughout the world for its nutritional values. Oregano is rich in minerals, such as calcium, magesium, iron, phosphorus, zinc, boron, potassium, copper and manganese. It contains 1600 mg of calcium per 100 grams, twice the amount found in American Cheese, 16 times the calcium of milk. Oregano is also ranked as one of best source of naturally occuring iron which diffrent from some of the synthetic iron found nultiple vitamins, is non-toxic and can be comsume by both men and women regardless of age. 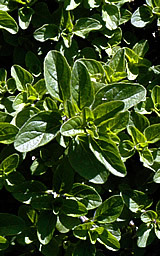 People use oil of oregano for many of its health benefits. The most well known benefit of oregano is its microbial killing powers. Oil of oregano is the premier natural antiseptic. Every microbe tested against it has been succumbs to it and there's no tendency for buildup of microbial resistance. Consumer Beware -- Do not Accept Counterfeit! Low carvacrol species (with carvacrol less than 40%) are not true oreganos. They are marjorams and are usually farm raised. They do not meet the above criteria. In particular, 20% carvacrol oil of oreganos have not been subjected to scientific scrutiny, as have the high carvacrol species. Oil of Oregano by North American Herb & Spice Co., as well as the SuperStrength variety, meets all seven criteria. Carvacrol levels are guaranteed 62% or higher. Here is the bonus: Oil of Oregano by North American Herb & Spice Co. has undergone scientific studies at Georgetown University.